As a part of building our concept game “Planet Destroyer” we’re talking to a series of industry experts and mentors to help us think through everything it takes to make a game. 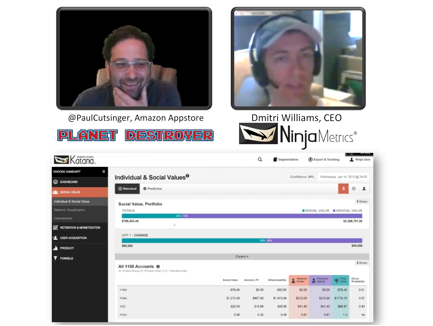 In this episode, our guest is Dmitri Williams, CEO of NinjaMetrics and we zero in on the social aspects of our game. The central idea of our concept game Planet Destroyer is that it’s focused on the relationship between a Twitch broadcaster and their viewers. It has to be highly interactive and social to succeed. With this in mind we spoke to Dmitri about how we can use analytics to measure and optimize the social aspects of our game to increase engagement and revenue. Please join the conversation live on http://twitch.tv/PaulCutsinger each Tuesday through Friday morning (PST). And follow @PaulCutsinger on Twitter for the latest.